Michele Roger is the founder of Great Lakes Conservatory. She offers lessons in piano, guitar, harp, violin, mandolin, voice and drums. In home, in studio and Skype lessons available. One to two recitals are offered per year as well as classes in music composition. Call 248-535-1754 for more information. Michele is a performing harpist. She has written and recorded 2 CDs. 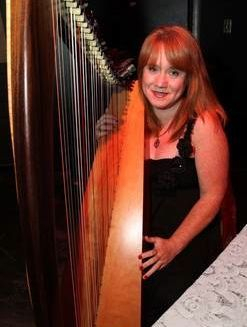 Known for combining her Irish roots with classical themes, Michele is available for events large and small. Summers and holidays book quickly, call for times and dates. Harp music turns every occasion into something special. In addition to being a musician, Michele is a published author. She has several books currently for sale, and is available for book signings. Her author page contains links to her current works.